Let me introduce you to the me you can never meet: The Me Before Rheumatoid Arthritis If you have RA, you spend lots of time adjusting to change. For me, the biggest adjustment has been to the disability. First, there is frustration that I cannot do what I still want to do. But the “old me” is still around – she lives on in my mind. However, she no longer matches the “physical me”. The second frustration is that no one else can know the mental me because the physical me cannot perform the actions which the mental me still wants to do. Effort has been spent to grieve what I can no longer do, accepting a new norm, and finding new ways to express that old me who did not die. When I meet someone new or fill out a bio, I hate to be asked what I like to do. I CAN’T do what I like to do anymore! So, I act like a grown-up and focus on things more important than whether I can quilt or play tennis. For this reason, I have been consciously learning more mature ways to define myself. While the Rheumatoid Arthritis will not allow me to express it in the same ways that I once did, I am still… creative, ambitious, independent, generous, and strong. I am still the kind of person who wants to get big things done! It has only been three and a half years since my Rheumatoid Arthritis became what I always call “full blown,” so I know I am still adjusting. Perhaps that is why I still get ticked off when people see me as lazy or wimpy. I wish I could show them that, before all this happened to me, I could have done what they are doing, too – at least as good as they do it. That is ironic since I spent so much effort moving forward. Nothing is too hard. If I can’t buy it, I will make it. I sew my own curtains, slipcovers, and clothes for my little ones. If I can’t buy it, I will make it.I have refinished dozens of pieces of furniture. I make Christmas presents. I am fit. I love to run and swim for hours. I do not ask for help. My dad was a United States Marine; sit-ups and push ups are recreation! Once, I bought a home with a 2 foot ditch dug out all the way around it. I convinced nearby road workers to dump a whole front loader of dirt in my front yard. I spent weeks with a wheel barrow and a rake grading the entire property. Then, I landscaped it properly so that it was the envy of the neighbors. I used to trim my trees, clean my gutters, and plant my vegetables. I kept my front entrance like a House Beautiful magazine cover. 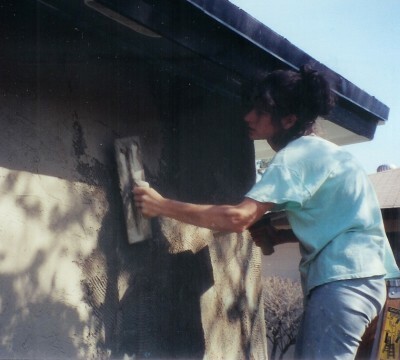 I bought 22 fifty pound bags of concrete, mixed them with water in my wheel barrow and put two coats of stucco on the outside of that house, too. Of course, I painted the whole thing inside and out. I even painted the playhouse to match. Inside the playhouse, I created sky on the ceiling, and flowery dunes on the walls. I make my soup from scratch. I bring meals to the sick. I have hosted many dinner parties and receptions in my home and in large church halls. I used to make all of the food and decorations myself. I can endure pain. I am a pretty tough cookie. I survived encephalitis without medicine. 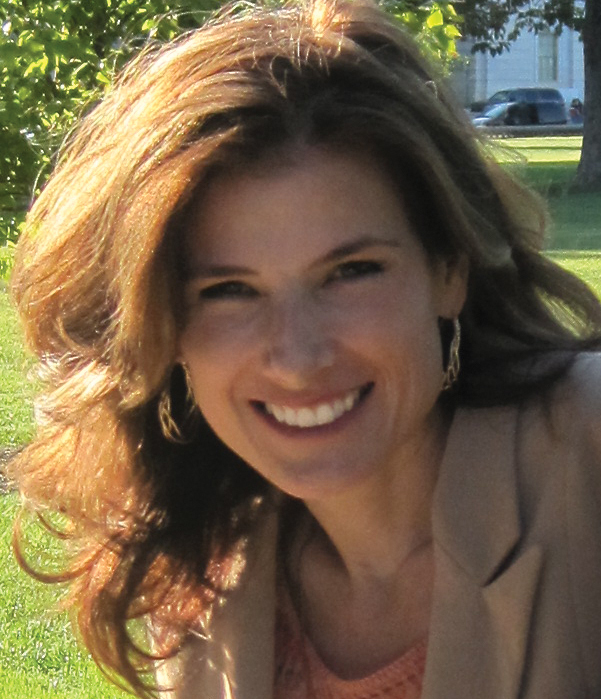 I had five babies at home with no pain medicine. I have homeschooled my kids. Two of them have a disability. Really, this is the tip of the proverbial iceberg. Whew! That was a whirlwind tour down memory lane. I hope that did not exhaust you, too. 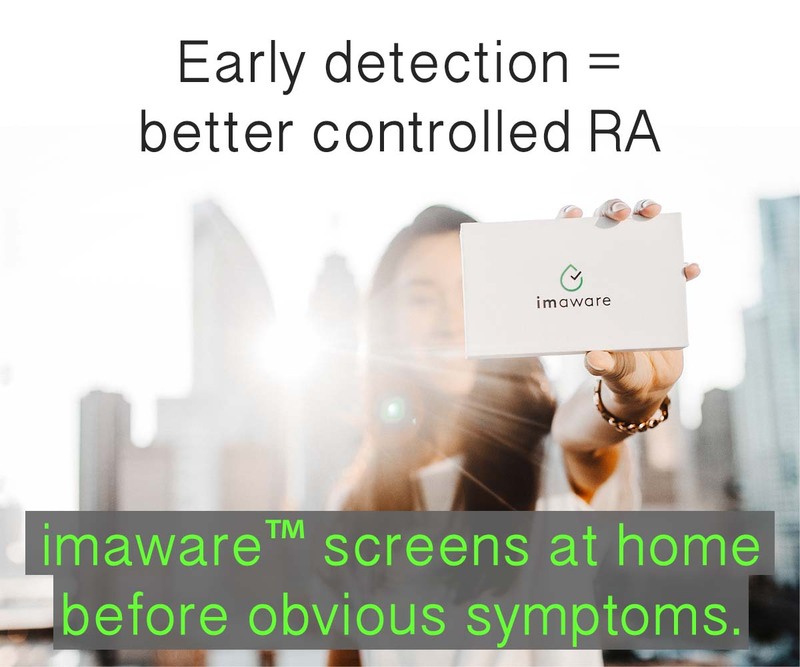 I went to an arthritis support meeting (mostly RA) last week and we discussed this issue a lot! The "old me" syndrome. Becoming disabled GRADUALLY really makes it more difficult I think, then top it off with seeing "the same physical person in the mirror", it's a mental screw! lol I used to LOVE kickboxing and I don't want to give it up…so on the not-so-bad days I still go, never put on the boxing gloves, never actually punch or kick the bag, and my friend goes with me…when we partner up she even "holds the bag for me" even though I'm not touching it 🙂 . I guess I just refuse to give up things I love and lose the "old me" entirely! That is awesome. Hold on to everything you can!My kids help me "fake it" like your friend does. Awesome. I just spent so much effort "accepting" the new reality that I am aggravated at people who judge me as a slacker. Feels like I get to know a big part of you from this post. The strong willed and energetic lady who's determined to handle anything that comes in her way. For that I really admire your strength. Most of us wouldn't understand the struggles you've been through, and we easily take things for granted. Thanks so much for sharing your story, and as a token of appreciation, will support your FB fan page. You've done fantastically with your blog with informative, inspirational content. Keep it up. A person who's mentally and spiritually fit is what make things happen eventually. I think the sentiments reflected in your post are very consistent with what I have learned in speaking with people living with RA over the years. Thank you for your openness and for your efforts with your blog. I believe it goes a long way in raising awareness about rheumatoid arthritis. Keep up the good workd and look forward to reading your future posts and perspectives. Wow! 22 years; You are quite a veteran RA fighter. Love your spirit. Funny…I've never looked at it that way. Maybe for me it's been a slower progression and seems to just make me age quicker than most. One of the most difficult days I had was seeing a woman of 90+ getting around far better than I…but then I always try to find solace in the old "I cried cause I had no shoes. Then I saw a man with no feet" mentality, and there are so many people worse off and so many far worse diseases to have. I have a friends with ALS as a constant reminder of that! – I'm grateful I never learned to play the guitar (though i tried many times). Glad now that i didn't succeed cause I'd be very frustrated at not being able to play. – Grateful I CAN still type (with LOTS of typos!) and even KNIT! – Glad I'm not a "trekke" cause I can't make the hand sign. – Very grateful for my health insurance and every new med that helps me stay pain free and active at 64 with 30+ years of RA and lost of permanent deformity! – Glad to have a sense of humor and glad that I was never very vain. – Grateful I was never a shoe-aholic cause all I can wear these days are mens extrawide sneaks that accommodate my AFO ankle braces. Glad to see you here Mirah! What a nice list! Great viewpoint from one who knows! Thank you. A note to a “stranger”- you’ve described a pre-RA life with which I am familiar- know you are not alone in mourning the loss of your pliability, your strength- your power. At night, alone, I still tie into my pointe shoes- and probably will do for as long as I can. Funny that a triple pirouette was an easy task not long ago and now I can’t even go up- but I’m determined to keep the lovelies close at hand- to celebrate what I did and never to forget who I was- and always will be. I pray you can find some beauty in that, as well (esp. because peach/pink satin holds tear stains more than blood, eh?). I was in a car accident yesterday so today I am not moving from bed, instead I am reading through old blogs of yours from before I was a follower. I think that mourning the loss of who I used to be is something I have done a lot of in the last two months. Recently I spent two weeks in July at school, on campus with other people my age (20’s) and older. I found that I had the most in common with a 65 year old breast cancer survivor than my 26 yr old friend of many years. I watched people my age party all night, dance the night away, drink liquor, sit through classes drinking coffee after coffee. I realized, I can’t dance all night, I need 10 hrs of sleep a night, I cant drink coffee like that because the meds I take gave me an ulcer. I can’t drink alcohol, the meds I take don’t allow me to. Sit 10 hrs a day in class? yeah right I got up every 30 min and even with that I was still on so many meds I could barely see straight. My days off I laid in bed on a heating pad with pain killers! I used to be a NCAA Div. 1 Diver that one day was told by the coach to jump in the pool and swim a NCAA Div 1 swimming race for a women who had just injured herself in the middle of a swim meet. I wasn’t a swimmer but I still won first place. I used to do cross country horseback riding (steeplechase) and jump 5 ft jumps on horseback. I was a professional ballerina who toured the US and Canada. I also taught and choreographed for shows and a private dance company. I was a gymnast, I also taught gymnastics for a team. I did color guard (flag twirling) for football season and competition. I played viola for 12 years and flute for 10 yrs. Thank you for your post Kelly. I hope the car accident was not serious! You have accomplished so much. You are stll the one who did those things even though you are not doing them today. Yes, it is very funny that funny how we have so much in common with friends in their 70’s and 80’s. But, we also have much in common with one another! I ran across a quote that helps me try to refocus on a positive side – The caterpillar thought she died till she found her beautiful butterfly wings – i dont know who said it or what the circumstances were. I do think it is fitting because we may not be able to do everything we did but we can find new ways of doing it. Thank you. That is just perfect. Lene on this post made a similar point, though less poetically. Does anyone know where I can find an RA support group around Riverside CA? Someone has suggested to me that you try < a target="blank" rel="nofollow" href="http://www.arthritisintrospective.org/supportsystems.htm" class="external" target="blank">this website to find one. I was fortunate enough to have been blessed with a rheumy that sent me to a christian counselor, because we have no support groups here. 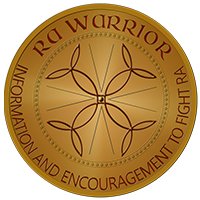 I don’t have RA, I have been fighting reactive arthritis for the past 12 years. My counselor said to me that you have a picture of how your life was suppose to be, but now you just keep the frame and plan out how your new picture will be. I was a special education and elementary school teacher. I breathed teaching kids. In fact it was my destiny. For the past 5 months, after being asked, I have been teaching Sunday School at my church. I have to say I like my new boss much better. I think arthiritis is a constant battle of the mind and body and I am very very thankful to have learned that the people in my life love me and would do anything for me. I use to reject that, and despised the thought of losing my independence. I am learning though that Christ wants us to love and care for one another. I am just on the receiving end a lot now. I am not usually a joiner of any types of support groups or any other groups in general, but my daughter sent me this blog link, and after roaming the site, I came across this blog. Tears filled my eyes the instant I saw it. After ten years with severe RA, and going through many secondaries, such as rashes, crazy lung infections, skin infections, and a massive heart attack at age 50 which almost took my life, everything I get now is even more complicated. I had been on Humira for about eight months when I had the heart attack and have not gone back on the drug even though it seemed to help. It has now been four years. Anyway, blah, blah, blah. I was talking to my husband a couple of nights ago and I mentioned that I didn’t want to be remembered by my friends and family as the person I have become with RA and all the stupid drugs that make me crazy and sitting in my stupid chair, and having to ask for help for almost everything. I used to do everything for everyone else. I used to love to play frisbee, volleyball, garden, entertain, go bowling, play guitar. I used to go to exercise classes and be in great shape…and when comes my time to see the Lord, all that will be said is…at least she is out of pain now…ugg…Thank you for writing “The Me Before RA” and thank you to my daughter for sending me this blog site. Dear Robin, Tears filled my eyes too as my daughter read me your comment. I’m sure your family will remember you for you generosity and servant heart. That can’t change even if it’s expressed in different ways now. God bless you, Robin. Your daughter obviously loves you very much. Thank you for your kind words. It feels good to know there are people out there who REALLY DO GET IT. I know and am thankful each and every day that my family loves me. My two daughters do remember that I was at every softball game, and every volleyball game. They even remember I had to sit in the front bottom bleacher because I couldn’t climb up and when the balls started flying, I couldn’t throw my hands up in the air to protect myself, so I would just let the ball hit me. I started making sure my husband would come with to block the balls. It was actually kinda funny, and we would laugh about it. I would call my family my “peeps” because they would be there for me, and they still are, only in different ways. I have no idea how you get the energy to do this, Kelly, but ‘WOW’. As always, thank you. I was just thinking about this yesterday. I was a very young mother and I am so glad that my sons are grown men and were when I was diagnosed. However, their children will never know the Grammy that used to run races down the street with their Daddies and their friends. The Grammy that had 8 or 10 kids spending the night every weekend. The Grammy that was always ‘fun’. They live on the opposite side of the country which 99% of the time makes me so sad – but at least they don’t see the Grammy that spends too much time in bed or in a chair or on the couch. And the other side is vanity. I never considered myself vain before. I was a very pretty 50 year old. I looked years younger than my age and felt the same. Now when I look in the mirror I see something entirely different. I see a face that is tired, I see lines that are different from the ‘laugh lines’ and lines from being out in the sun too much doing gardening. I see lines from constant pain and stiffness. I see a woman who so badly wants to feel the warmth of the sun while her arms are covered in sweet smelling earth. I am still that same woman but it is like RA has built this wall that I can’t get through. I am on one side and the other me is on the other side. What makes me sad is that I don’t think the 2 “mes” will ever come together again and make me whole. I understand that I am aging and have no issue with getting the lines on my face from smiling and living. I do have an issue with the lines I am getting from the constant wincing from pain. Those lines make me want to cry. My husband adores me and is so supportive. He is not shallow at all and still thinks I am beautiful but it is hard for me to see that tired and wincing face that was not there a few short years ago. Have a blessed day Kelly and although I have said it many times before THANK YOU so much for all that you do for your Warrior Clan! Lady, I salute you! Keep up the good fight. Maybe we can’t overcome this disease, but that doesn’t keep us from fighting when and where we can. Don’t let people who don’t know what we go through discourage you. Just smile and love them. They mean well. We all have something in our lives, sooner or later, we have to face, one way or another. Very few of us go through life unscathed. Understanding comes through facing one’s own trials. Look back in gratitude; look forward with faith and determination. God bless you! Great words to live by, Pat. God bless you too. At least 1 good thing comes from it – don’t you think these struggles give us more compassionate hearts for others who suffer? Ah, Kelly! You perfectly express what so many of us feel and deal with. This post can help us try to communicate with friends & family, and it just helps us (me!) feel we’re not in it alone. Honestly, your site is like a bottomless treasure chest. I keep discovering new gems here! Thank you!! :heart: You can email the post to them if you want with the little envelope link below. Thank you so much for putting into words what I have been trying, (without success) to explain to my family & friends ever since my diagnosis nearly a year ago. I miss the old me and like you said she is still there in my mind. My co-workers used to call me “supermom”. I used to build tin foil castles in the living room out of boxes covered in tinfoil and sew curtains to go with it. I used to taxi my kids to sports and lessons. I used to be an active part of my religious community and loved to plan parties and baby showers. I think the hardest part of this disease is learning to give up the life you once had and loved. Thank you so much for this website!!! Hi Ruby, I could just see the castles! :rainbow: What a special lady you must be. I’m sorry you have to have RA but I’m glad you are here. Oh, friend and fellow warrior- how I relate to this post! I’m not even a year into “full-blown” RA- at 37- and yet I limp around, fear a fall, go numb, typing, etc. Before this? I was 10 hours away from my single-engine pilot’s license. I traveled all over the world- the EU, Asia-you name it-I’ve researched a novel for 15 years that I am determined to complete, even if it’s via dictation! I was a pre-professional ballerina and a Senior Account Manager for an international corporation. Now, my husband pours milk for me; holds my hair as I expel MTX, and time with friends is always a “maybe”, as I never know if I’ll be able to dress. But I am STILL Nicole and always will be, even if my body runs from me. Thank you for this post- your honesty- your savage fight. It helps me pull myself up and do ONE thing that matters to ME in a day. Thank you Nicole. Your fighting spirit puts tears in my eyes & fuels my fire too. Kelly, you humble me DAILY. I spent yesterday in bed- all of it- from pain and fear. Today I got up, because I can’t allow myself to sink into the Abyss- and your site helps me more than I can ever express-you and all of the brave people here remind me I’m not alone in seeing a stranger in the mirror, or wondering if I can make it four more hours until it’s time for pain meds and a walk (if I can do it). I think this proves the insidiousness of silence when anyone suffers- and the gift of sharing ourselves- cliched? Maybe- but life-lines are simply that- and you’ve made one. You remind me to be Nicole on days I’m not. God bless you. I hope this post from you 2 years ago reaches you. I really appreciated the poetry of your example to focus on the positive. To Kelly and Everyone: I truly mourn for so many RA patients who miss their past of ballet, competitive and highly-active sports, etc. You clearly didn’t take for granted your physical pursuits when you could do them. I have deep regrets that I didn’t do more sports when I could — more hiking, more biking, more horseback riding are things I miss — communing with nature on my own. 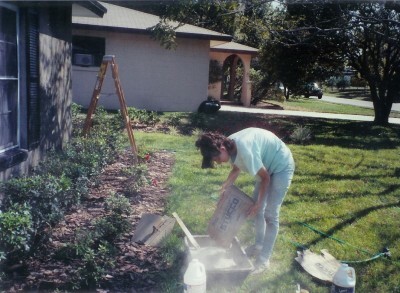 I do have a past like Kelly of being a landscaper and dirt hauler “extraordinaire!” How I miss changing and designing over an acre of nothing to a manicured showpiece with my bare hands. It was hard work, but so rewarding! I have been blessed with creativity and I focus on my inherent drive to create, as I can still do that. My mind is my haven from the very quick onset of this severe case of RA. I didn’t have much time to say “good bye” to the old me; my family not much time to welcome the “new me”; however, I still have hope that some form of quality of life can be found through my med regimen, which is brand new. I focus on the blessings of my family, as I have truly been given a treasure in my support system; my husband and teenage sons who all cook, clean, assist me when needed, and most importantly, make me laugh. My mom, who has always made me believe I can do anything, still tells me how much she believes in me. And of course my faith in God, which reminds me daily that I am His daughter, and there is a plan for me upon this earth — perhaps understanding that plan of deeper importance, now that I have a firmer grasp on humility. Perhaps having to try harder now will allow me to feel a deeper sense of accomplishment, experience more joy in those milestones, and have a deeper appreciation for the things I CAN take with me, namely my education, my experiences and my family, as family is forever. Thank you Kelly for all your efforts on our behalf. Thanks for paving the way! Thanks for generously sharing your experience here. It really helps others who read later. I know I hope you read this too since I’ve been away for a few days & I’m catching up on comments now. You have a true gift. Please don’t stop what you are doing. It’s easy to become discouraged, and then I read your blog. Thank you. THANK YOU, too! It’s easy for me to become discouraged also and those words do help. I hear you , sister. My list ranges from making pastry from scratch and sewing to welding and doing all my car repairs and maintenance myself, playing about 12 sports, 3 instruments and generally bouncing more than walking everywhere. What gets me the most is that my daughter will never know “the old me”, and her childhood will miss out on the energy and tomfoolery that she deserves. And instead of being a father who teaches her that yes, men can sew and cook and clean and bake and dance and iron etc etc, as well as do all the “blokey” stuff, I’m now the father that lies on the couch while the mother does all the housework – and that cuts your heart out with a cold, blunt spoon. The other real annoying part is when people say “yeah, we’re all getting older.” as though aging 40 years in the last 3 is just what everyone else is going through. So thanks for your story and a place where we can all feel less alone with our challenge, and may you have more “good days” than bad. Thank you for stating that so well, Craig. If it brought tears to my eyes, as much as I know, then I hope everyone who reads will “get it” a little bit more. I had a doctor ask me the other day what my hobbies were. I said golfing and choked up as the words were coming out of my mouth, then added, well..used to be. From every weekend to a pitiful 9 holes about 4 months ago. I keep saying “when I get better.” I hope that day will come. You made all the same mistakes I did, with extensive wheelbarrowing, repetious 50 lb bags, etc. Your entire spine is likely shot. Just like mine. Some of your sx are likely spinal in origin, independent of RA inflammation. Discriminating which is causal, at least in some instances, could be challenging. RA drugs may not be enough for certain pain issues. Not that it matters; there are no real pain meds anyhow, nor good Tx for spinal damage. The me before RA was intelligent, ambitious, self-sufficient, loved to travel with my husband and looked forward to it, held a very responsible job for 16 years and enjoyed my grandkids. Now I hurt in different areas in a rotating schedule and keep track of the next pain pill time. I now have pulmonary fibrosis caused by RA, am on oxygen 24/7, had to quit my job and am on disability fighting every day to do anything before my lungs won’t let me until I rest. I have to have my daughter or husband do most everything for me and I hate that. Dear Sharon, of course you don’t like that you’ve had these unwelcome changes! You must still be as intelligent and ambitious as always – and as self sufficient as possible. Probably self-sufficiency versus dependency is a battle for many of us – I know it is for me. I sometimes wonder whether self-sufficiency is as important as we think it is – I bet your husband and daughter gladly do those things. Thanks Kelly. I don’t feel as intelligent as when I was out with people and working nor am I very self sufficient. A good day is getting dressed and getting the dishes done; maybe fix a simple dinner. Oh, for the good old days!!! My heart really hurts for you because I know how you feel. God and I had a conversation about that just this past weekend. For me, it is a moment by moment process-times when I can except it better than others. I am really sorry, Kelly, that anyone has to deal with the losing of the things they love and until they go through it they just don’t get. Thank you, for taking the time and energy to post how you are feeling so we have an outlet for how we are feeling. OMG Kelly, definitely an impressive resume of motherhood and activities. Anyone who calls you lazy needs to examine their own lifestyle. You sound a lot like me esp sewing all my 3 girls clothes, I worked full time nights as an Resp Therapist, girl scout leader for all of them…I won’t try to compare to your accomplishments but it does explain why we grieve so much when there is this young energetic trapped inside a body that isn’t cooperating. I’m 50 now and still wish I could hike,zipline and rappel unfortunately the pain these activities cause prohibits me from doing them. Now I learn to appreciate more the small things squirrels chasing in the backyard, watching the seasons change by the leaves on my tree. I can no longer work so I have more time now to learn new ways to enjoy life and express myself as you have done. You’re bringing tears to my eyes. It’s been 14 years since my RA story began and we’re still searching for an answer for me. It helps me to hear your story too. Every day I still think I might like to do so-and-so & then realize I can’t so while I try not to – I still think about this too some. I have only had RA for less than two years. Less than a year on meds. There are a few things of the old me I have had to let go or learn how to do differently, but I cling hard to most of the old me. I refuse to let this thing bring me down or keep me from doing the things I love. Before the meds, it was doing a good job. But even then, I did not stop doing what I could, pain or not. I want to go on with my life much as I did before, volunteering, working, and playing with my grandkids. Sometime moving is so painful, I want to cry, but the more pain I am in, the more determined I become. I refuse to be dead until I am dead. 🙂 My mother suffered all her life with RA and other things equally painful. She was a single mom of two kids and did not have the luxury of giving in to her issues. She was my Hero and role model even if I did not always understand this. The old me is alive and kicking, just learning new tricks! the old stuff that I had done in my before life. It seems like they understood how painful and life changing broken backs can be, but they couldn’t understand the changes that RA forced on me. The advertisers who make RA, etc. sound like a walk in the park if you just take the right medication, really don’t help with the perception that many people have of what RA is like for most of us even when the medication is working. I don’t believe how I am sitting here, finally 2 years after diagnosis, reading a blog that stirs my heart. There is definitely the “me” before and the “me” after. I am crying for the old me tears that have never been shed but are probably long overdue. I grieve for that other person but know this is my new reality and am slowly coming to grips with it. Thank you for this outlet. I was diagnosed in Sept. 2010, so closing in on two years now. It has only been within the last month that I was truly able to grieve the loss of who I was, who I will never be again. It is a bitter pill when people say foolish things like, “you just need to push through it”. I try not to wish an ounce of my pain on them so that they can see why I cannot just “push through it”. I’m blessed, my husband has always understood, as well as anyone not afflicted with this can. My parents are only just realizing how bad it is, as are my in-laws. This has come about mainly because my doctor prescribed a wheelchair for me. Praying for you sister. The Me Before RA: Went to business school. Became Wife and Mother of two. Played hard and worked hard. 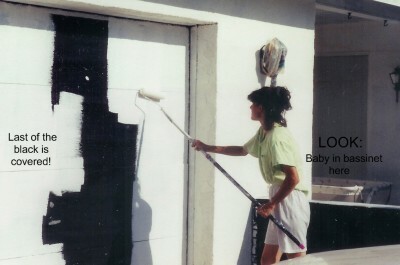 Helped roof the garage, painted the house. Knew my way around a Cub Cadet. Helped run a junk yard, and could operate the tow truck. Raised the kids. Later in my med-forties, I started my own business and opened an antique shop. I could knock down a bedroom suite and haul and load it my self. Toured Europe on my own 4 times, walking many miles a day, up and down mountains, photographing, buying and shipping to the shop, sleeping in hotels and in pensiones and going where the mood struck. Cancer hit me at 55 before the RA and got over that one in about 6 months. After RA (about 3 years ago)I’ve had another cancer, and it hadn’t spread so just did radiation and surgery. Bounced back from that quickly, and was only without RA drugs for about 6 weeks. – – – – – With RA I now have a lawn service, and no longer sprint across parking lots, and managing a bathtub is no longer an option. I retired 5 years ago and didn’t do well not working. If you saw me today you wouldn’t know I was sick or ever had been. I don’t really talk about it, except for on here. We each handle adversity in our own way. I’ve begun painting watercolors from my own photos. Have no talent but love making pretty. Began working again. Drugs, trips to my RA clinic, oncologists and hiring workmen is expensive. Play cards once a month. Go out with friends. Planted an organic garden last year to eat better. Vitamin D therapy gave me almost total energy back. Meaningful work is my key to feeling good. So, doing well for now. So impressive to read of your many accomplishments before RA came along. I like you was a walk-many-miles-a-day, work-out-for-hours-for-fun, bild-your-own-house, raise-a-child-while-engaging-in-a-demanding-profession kind of gal. RA is requiring me to ascertain new ways of doing that which I still can and adjusting my self image to accommodate the new me who can not do everything I love. I really miss dance (having worked my way through law school as a dance instructor). But I am grateful to still have the law. Image adjustment is hard but I guess we must all do it as we journey through life and live the many little lives that combined together form our comprehensive life journey. Forgive me, but I don’t understand and the pain is still there! Jennifer, I agree with Charlene that writing a letter might help other patients be spared the inappropriate, patronizing and insensitive treatment you received. When I moved 10 years ago, I went to a new rheumatologist who said my xrays were normal, my sed rate was normal, and actually wrote in a note that my symptoms seemed out of proportion to the objective findings. I had had a diagnosis of RA (with rheumatoid factor and CCP) for 7 or 8 years, and had been treated for RA previously by 3 rheumatologists. This dr. thought he had discovered that I was fine. I immediately made an appt with a different rheumatologist, who I have now been seeing for 10 years and she is wonderful and compassionate and believes what I tell her, even when not visible on the day of my visit. Maybe you can ask around for a recommendation; sometimes it takes a few tries to find a dr who can listen…. best wishes. Jennifer, my advice is to report, report, report, in writing, that intern to the hospital board,the hospital CEO, her chief supervisor, the medical board, the main hospital CEO if you went to a smaller clinic/hospital of a larger organization, and anyone else you can think of that needs to know about her. She doesn’t need to be practicing medicine, and her “friends” who were laughing at you definitely need to be taken to task, too. As long as the hospital has your name, date, and a time frame they will be able to pinpoint exactly who was involved. They won’t know if you don’t tell them, though. Hope you feel better. Gentle hugs. Hello meliann, This is a question to Jennifer too. When you change doctors, are all your records transferred to the new rheumatologist? Are your prescriptions, drugs, and dosages transferred to the new office also? It is scairy to think my good care would not be available if I move or need to change Dr.s. Hi Susan, I have been in a healthcare network with electronic records, so any doctor in the system can pull up all notes, labs, xrays. But when that is not the case, you should be able to request either that all your records be forwarded to the new physician you choose, or you can ask for your records to be copied and then pick them up yourself and take with you. I am 49 years old,and just got diagnosed with Rheumatoid arthritis last week. I had symptoms for 3 weeks before I called and demanded an appointment with a rheumatologist because I knew the daily joint pain and swelling in my hands, wrists and feet were not normal, or anything I had ever experience before. It scared me actually. To top everything off, I am currently going through treatments with Faslodex for recurrence of Breast Cancer. The breast cancer and faslodex has never kept me from being active. In fact, I’ve played tennis competitively for 14 years, ran 4 half-marathons, the last one barely 6 months ago, cylced 20 miles at a time, did zumba 2x per week, but now the swelling and pain in the joints of my hands and feet have stopped me dead in my tracks. I always thought how cool it would be for my grandkids to tell their friends that their grandmother is a competitive tennis player…I’m not sure that will happen anymore…the stiffness, joint pain, weakness in my hands doesn’t even let me hold a pitcher of tea in my hands. I can barely walk 2 miles on a treadmill. I’ll start Methotrexate soon, and hopefully have good results. I’m hopeful to get somewhere near to were I was. Reading your post really resonates with me. People around don’t know…they don’t see the struggles I am having, and honestly, I don’t want to tell them. Just like I didn’t tell many about my breast cancer. Very few know about that even now. No matter what, I will do my best to stay active and stay positive. I still cry when I am alone about this whole thing. Cannot believe I was hit with 2 big whammies in less than a year…breast cancer recurrence AND rheumatoid arthritis. I am going to have an ALCAT test done at my expense. It was recommended to my by an oncologist. It will show what I am allergic to…food or environmentsl, and help me improve my immune system by making some real changes in my diet, etc. He also recommended pilates and tai chi. I’ve never been a fan of slow movement…haha…but I will do anything to make my joint situation better. I have a much bigger appreciation of people who have this disease now. I never knew. No one really knows unless they are experiencing it also. We are sisters in this struggle. We must help each other and push for more research…a cure. Blessings to all of you who fight the fight every day. My RA was diagnosed almost a year ago. I am 65 but started looking for a diagnoses 5 years ago and the more I read and learn I’m sure it started for me in my mid to late 40′s but they did not diagnose it completely until recently. Two of my dad’s siblings actually passed away from RA. My ankle was broken badly in three places a few years ago and appeared to be healing until the foot and ankle started making loud popping noise whenever I walked. After the RA diagnoses I have been fitted with a Richie brace which helps my mobility to where I don’t fall as much however the ankle pain as well as shoulder pain and fatigue is difficult to deal with. Extreme fatigue has plagued me since my early 50′s along with foot swelling and pain. During this time I was working 14 hours a days to support our family. I knew I was getting older but kept telling my doctor that I did not think the fatigue should be that great for the age group. I do have a high tolerance for pain. You describe so well my grief over the person I was and the person my mind still thinks I am. I found your website from the Women’s magazine article I picked up when I was waiting on a friend I have been taking for her radiation treatments for cancer and I am so grateful to find something that helps validate my feelings. It’s good to meet you Tempie. You’re a great friend to go with her for treatments and I hope she does well. The fact that it started 20 yrs before diagnosis and that relatives died related to it – those are common themes – ones we hope to change! This sounded so much like me. I was recently diagnosed with RA, it was a tiny relief knowing that I have a disease and am not crazy. I do not have insurance and cannot get meds or go to doc. So I wait, and try to find a way, I did get some prednisone, so I feel better this week, than I have in months. Your story reminded me of the old me, preschool teacher, hiker, funloving grandma,hardworking, not afraid to tackle anything, trained and rescued horses etc.. Then the new RA me, crying each day because I can’t usually tie my shoes. Mostmornings I can’t comb my hair. Steps are terrifying. I feel that friends and family think I’m fine and faking. I’m getting really depressed. Thanks for sharing. Hi Rebecca. Go to a rheumatologist. Tell him your circumstances, ask for advice, and the name of a clinic that will treat uninsured. Or find a free womens clinic and ask them for assistance with finding help. 8 years ago I had no insurance when the disease hit. I was a year without diagnosis. Find a clinic that does drug studys, they are provided free. Above all get treatment. You will feel better. Thanks Susan, I’m calling everywhere, I have applied for some assistance through Sacred Heart Medical Center, sounds promising. I can’t find any free clinics that deal with RA in my area. I will not give up. How are you now? Is treatment helping? I want to scream this for the entire world to see! But especially for them that see my house and farm and wonder why I no longer have my beautiful animals, or gave up my dairy business plan, and why I have not “bothered” to do much landscaping since we moved here. 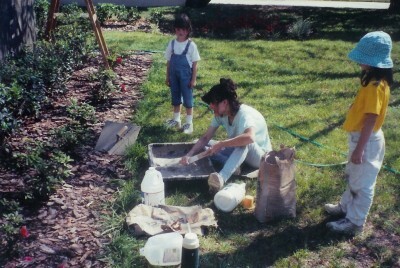 “Wow- you USED to have the most gorgeous flower gardens!” Yeah, no kidding- I miss them too. All of it. All of ME. I raised all of my own meat, vegetables and planted fruit and nut trees and many herbs. I milked and maintained dairy goats and made cheeses and butter. I don’t WANT to be angry and bitter- I just AM. I spent an entire life savings on this farm- just to have it mock me. But I know I have to change that. About the time that I think I have- BOOM! Some idiot gets in my face about my life and why I have given up. I didn’t- my body did! I WANT to be as vital of a human being as I used to be. There must be a way. Hi I have been looking at your blog and I don’t seem to find anything about leaky gut syndrome. I have RA symptoms however they can all start from this LGS. Have you or anyone tried this first? I’ll be sharing this post, too. It’s so much like my life! I, too, used to be so full of energy, strength, and plans for all that I was going to do. Almost four years ago I moved to the house I am living in now, and I started off with three sheets of legal paper full of To Do items. Each day I’d check off several items I’d completed (painting, tearing down old walls, putting up new ones, digging up a yard full of cacti, etc etc). Now I’m lucky if I can manage to wash up my dinner dishes at the end of a long day. There have been days when I could not even brush my teeth, much less keep up with all the cleaning, the yard work, walking the dogs. No more 14 mile hikes, no more 42 mile backpacking trips, no more 3 day canoe trips. No more pushups. No more races at the gym to see who can do the most chest presses the fastest. No more using my arms for just about anything. It’s tough to go from that to sitting on the swing on the porch, but now I have four dogs to watch and play with, and that brings a lot of joy, too. I miss my old self and my old life so much, but I’m trying to find new ways to enjoy my daily existence. We are not the same and for the first time ever you put in to words what I feel. Thank you for the post. I spend a lot of my time being optimistic and resigned to just live my best life. Sometimes though, it is important to mourn what has been lost. It is hard to explain to my young kids why I can’t teach them to ride a bike. Why does that stand out so much? They have no memory of me being able to run. My identity crisis was way worse on other meds that made me so sick. I felt like I wasn’t fun anymore. I wish I had known then it was the meds and not the disease. What a journey. I so totally get this. I often look in the mirror for the old me. The woman who danced the night away gardener ran and enjoyed everything. I now look and see so much deformity. Who am I? As this disease progresses I become more and more silent. I watch how a loving partner has become abusive and hateful.